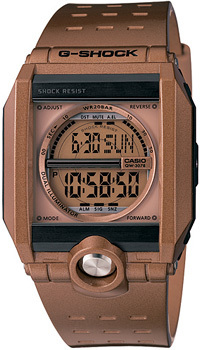 Casio G-Shock G8100A-5 For The Steampunk Fans | OhGizmo! If you’re looking for a watch with modern electronic features but a somewhat ‘antique’ design, the G8100A-5 G-Shock model from Casio appears to have been inspired by the recent ‘steampunk’ trend. The bronze colored aluminum square face and perforated resin band make it look like a rare find featured on the Antiques Roadshow, but without the ridiculously over-estimated at-auction value. In fact at $99 it’s quite affordable, but still manages to pack in a lot of the features that the G-Shock brand is known for. Thats weird looking. It definitely does not look like a gshock. A bit square.